• For quantitative determination of HDL and LDL/VLDL cholesterol and evaluation of drug effects on HDL and LDL/VLDL metabolism. • Convenient. Room temperature assay. No 37?C heater is needed. • Cholesterol concentrations in High-Density Lipoprotein (HDL) and Low-Density (LDL)/Very-Low-Density (VLDL) Lipoproteins are strong predictors for coronary heart disease. Functional HDL offers protection by removing cholesterol from cells and atheroma. Higher concentrations of LDL and lower concentrations of functional HDL are strongly associated with cardiovascular disease due to higher risk of atherosclerosis. The balances between high- and low-density lipoproteins are solely genetically determined, but can be changed by medications, food choices and other factors. Simple, direct and automation-ready procedures for measuring HDL and LDL/VLDL concentrations are very desirable. BioAssay Systems HDL and LDL/VLDL quantification kit is based on our improved PEG precipitation method in which HDL and LDL/VLDL are separated, and cholesterol concentrations are determined using cholesterol esterase/cholesterol dehydrogenase reagent. In this reaction, NAD is reduced to NADH. The optical density of the formed NADH at 340 nm is directly proportionate to the cholesterol concentration in the sample. 1. Would you please confirm me cat# EHDL-100 can be used for Rat or not? 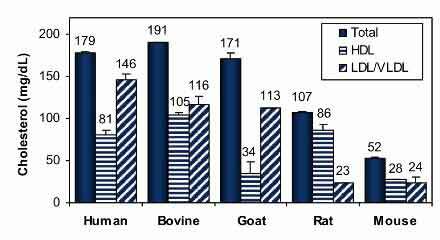 Yes, the assay is not species-specific and works with rat serum samples. 2. Could they be used with lung tissue homogenates? Yes, but the EnzyChrom? HDL and LDL/VLDL assay kits were developed for serum samples to detect the various transport forms of cholesterol. For tissue samples I would rather recommend using our cholesterol assay kits ECCH-100/E2CH-100. 3. We would like to know if, during the procedure and before the OD measurement, the reagent added to the serum inactivates hepathitis C virus. No. The EHDL-100 assay reagents will not inactivate hepatitis C virus, or any other virus.